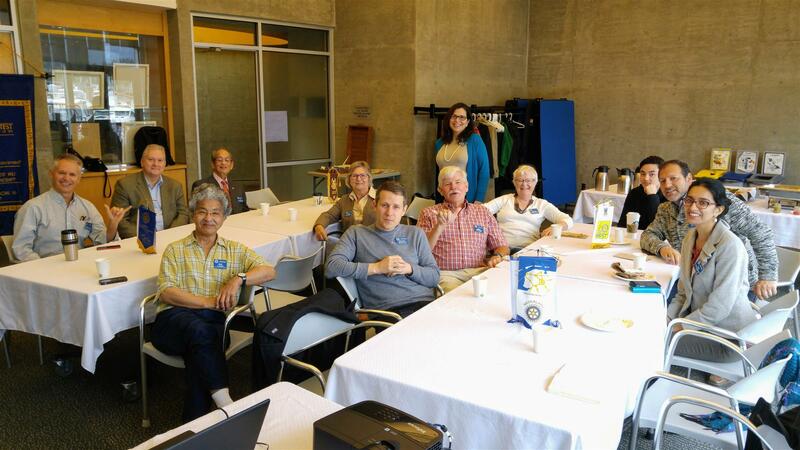 At this Wednesday's meeting, we had 14 members present as well as 1 guest, Glenn Wilson. Sam Owori is selected to be 2018-19 Rotary president. The 2016-17 Nominating Committee for President of Rotary International has unanimously nominated Samuel Frobisher Owori, of the Rotary Club of Kampala, Uganda, to be the president of Rotary International in 2018-19. Don't forget to send out the email to your contacts to gather pledges for the Hoopathon! Our changeover brunch will be June 25th. Date to be confirmed very soon. Meeting - Today we had a business meeting. These meetings take place after the monthly board meetings. In these meetings, we discuss our club's operation as well as our ongoing and future projects. Tina spoke to the club about her experiences in Uganda with children's rights and the law. In particular, she described her six month internship through the Canadian Bar Association on a project called Supporting Access to Justice for Children and Youth in East Africa. She worked within the Ugandan Ministry of Justice and Constitutional Affairs and described, for example, a monitoring visit to a remand centre that holds children who have come into conflict with the law and a media tour of Justice Centres Uganda, an innovative effort to ensure citizens outside of the most urban areas of Uganda have access to free legal services and advice. Tina will continue this presentation with specific examples of the Ugandan justice system in action and concluding remarks at a meeting in August.